Can't type @ using Shift+2 on your computer. Getting " symbol instead of @ symbol. All the keys on a computer are important. But @ Key is much more important. You can not type an email without using @ key. It is not practical to use 'On Screen Keyboard' always. here is the easiest way to solve. 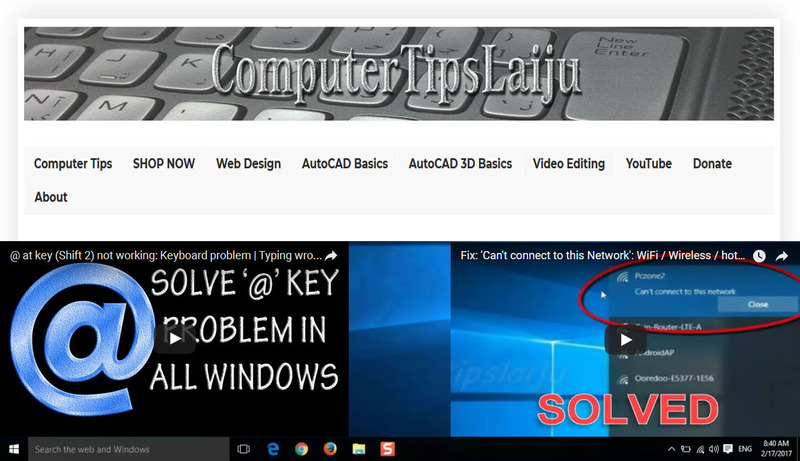 Windows 7 Users Watch this: How to Fix @ key problem on Windows 7? Here it is explained in detail. How to fix @ key problem on Windows 7,8 and windows 10. If '@' at key (Shift 2) on Keyboard not working, Typing "the wrong character, Don't worry...Your keyboard is 100% perfect. You just need to do some changes on input language configurations. This will work in windows 10 latest updated versions also. Just with some clicks in your control panel language settings, you can solve this problem. A wrong input language configuration on a computer will cause this kind of keyboard problems. There are different keyboard layouts. You must use proper input languages on each kind of keyboard layout. If your computer is using English US layout Keyboard (QWERTY), it is better to use 'English United States' as default input language. If you choose 'English Untied Kingdom' on this US keyboard, you will get " (quot Symbol) instead of @ Symbol. 1. On the search window, search for language. 4. Make sure that you are connected to the internet. 5. Search for English United State language and double-click on it. 6. Windows update service must be enabled and running. 7. complete language installation and enjoy using @ key.